This is a Reduced Scientific Report resulting from NERC Geophysical Equipment Facility Minor Loan 1058, principal investigator Dr Duncan Quincey. As per Loan Number 1050, our project set out to generate 2.5-3D topographic models using both satellite and ground-based methods. King was focussing on detecting glacial lake development using remote sensing. Previous work has suggested that certain conditions exist under which glacial lake formation may be favourable. He had three objectives: 1. To identify glaciers that have experienced significant mass loss and surface lowering over multi-decadal timescales; 2. To identify glaciers where surface slope has decreased below a threshold value of degrees and where areas of reverse glacier surface slope may exist; and 3. To identify glaciers that show negligible or no flow over large parts of their surface. He therefore generated DEMs of Difference using stereoscopic satellite imagery acquired by the ALOS PRISM, ASTER and SPOT sensors and needed GCPs to generate the models and to provide check-point data. Watson was using remote sensing and field-based surveying methods to quantify the importance of supraglacial pond development and associated ice cliff melt to the surface water storage budget of debris-covered glaciers. In the field he focussed on generating multitemporal topographic models of backwasting (melting) ice-cliffs using Structure-from-Motion, as well as measuring pond bathymetry and its seasonal variability. He therefore also needed GCPs to generate the SfM models and to provide check-point data. King gathered more than 50 ground control points and check-points that have allowed him to create multi-temporal DEMs over the glaciers in our study area. He has shown that the glaciers have negative mass balance and that those with a terminal lake are more heavily in recession that those without. This work has recently been published in The Cryosphere (doi:10.5194/tc-11-407-2017) and a second paper is being prepared for Global and Planetary Change focussing on the links between surface elevation and glacier velocity over decadal timescales. Watson gathered more than 450 ground control points and check-points over several seasons, which have allowed him to quantify mass-loss at exposed ice-cliff faces (published in Journal of Glaciology in 2017; doi: https://doi.org/10.1017/jog.2017.47) and characterise the thermal regime and storage potential of supraglacial ponds (published in Earth Surface Processes and Landforms in 2017; doi: https://doi.org/10.1002/esp.4236. 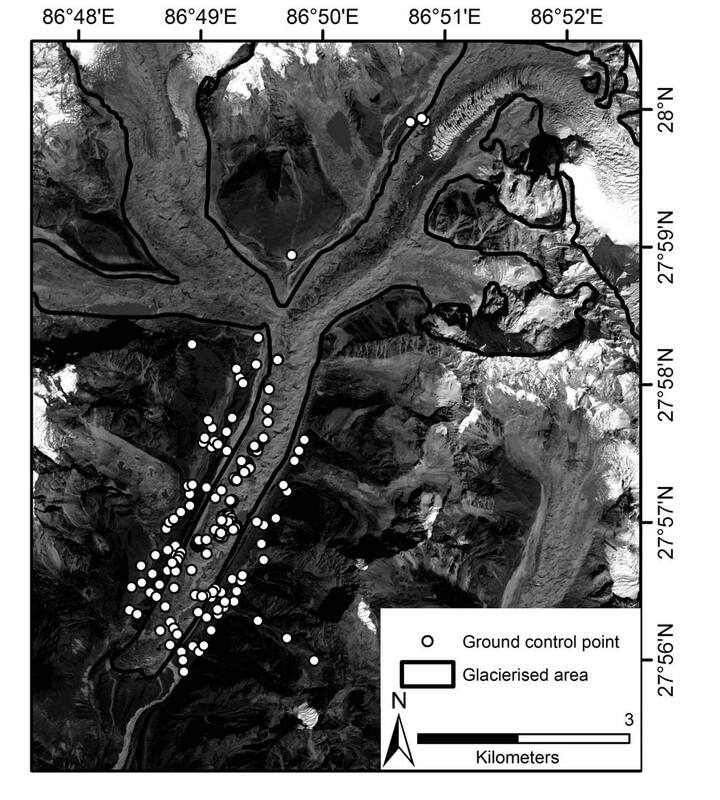 High-contrast temporary ground control points (GCPs) were distributed around each ice cliff (number of GCPs = 6-15 per cliff) and across stable terrain throughout the Khumbu Valley (n = 45) and surveyed using the Leica GS10. Each GCP was occupied in static mode for up to 10 minutes. A base station was located on the lateral moraine of the glacier < 2 km from our survey sites for the duration of each field campaign and was set to record each day. The GPS data were post-processed in Leica GeoOffice. Our GNSS base station data were post-processed against the Syangboche permanent base station (27.8142N, 86.7125E) located ~20 km from our field site using GPS and GLONASS satellites. Our field GCPs were then adjusted with reference to the field base station data following a relative carrier phase positioning strategy using Leica GeoOffice software and satellite ephemeris information accessed after GCP acquisition. Mean stated GeoOffice error was 4.8 mm across all points (n=523) indicating the maximum accuracy of the instrument was reached (~1 cm in plan and ~2 cm in elevation). The Leica GS10 units were excellent - there were no issues with them at any point in our work, and thanks to the training from GEF staff in Edinburgh we had no issues acquiring the data in the field. The post-processed data are accurate to within several centimetres, and the loan has directly led to four published papers in high-impact journals, with another currently in preparation. The data collected during this project and supported by the loan have partly also led to a successful Standard Grant application to continue working at this site (NE/P00265X/1). King, O., Quincey, D. J., Carrivick, J. L., and Rowan, A. V., 2017. Spatial variability in mass loss of glaciers in the Everest region, central Himalayas, between 2000 and 2015. The Cryosphere, 11, 407-426. Watson, C.S., Quincey, D.J., Carrivick, J.L., Smith, M.W., Rowan, A.V. and James, M. 2017. Quantifying ice cliff evolution with multi-temporal point clouds on the debris-covered Khumbu Glacier, Nepal. Journal of Glaciology, 63(241) 823–837. Watson, C.S., Quincey, D.J., Carrivick, J.L., Smith, M.W., Rowan, A.V. and Richardson, R., 2017. Heterogeneous water storage and thermal regime of supraglacial ponds on debris‐covered glaciers. Earth Surface Processes and Landforms. All of the GNSS carrier phase raw data have been archived in the National Geoscience Data Centre (http://www. bgs.ac.uk/services/ngdc/) - dataset id: 13607143. Figure 1. The Khumbu Glacier and the locations of the 523 ground control points collected during this project and two related (loans 1050 and 1065) field campaigns.